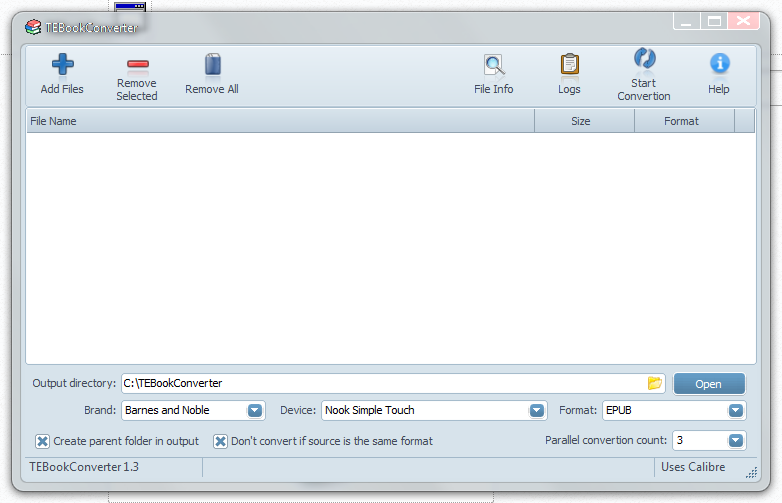 TEBookConverter is an alternative and simpler GUI for Calibre. It supports all the input and output formats Calibre supports. It also has presets for devices (Kindle, Nook etc) to make things even easier. It comes in both 32/64bit favors. I'm looking for translators for this project. If you are interested, I've attached the master translation file and a help file. It shouldn't take more than thirty minutes since there are not many strings to translate. I plan to release a new version in a few days so I'd appreciate if you could send me translations as soon as possible. This is about 6 months old now but Ghacks gave TEBookConverter 5 stars. I have not updated this program in a while but there have been several Calibre updates. If you want and if you have calibre installed, you can copy calibre installation to Calibre folder located in TEBookConverter folder. Would it be possible that you implement a simple progress bar which shows the current job progress? IIRC calibre doesn't report it's progress in a way that is useful. But I will take a look. Of course this is not of great importance, thanks for your response. If you'd like you may ask him why he did that, his e-mail can be found here. i didn't even try to look on github! One cannot remember all possible repositories. It is a pity that ozok deleted so much useful stuff- I remember that once while he was still developing his tools he responded to several messages of mine. I have most of his programs archived and if needed I can upload some of them.